(CNN) -- A 1-by-5-mile sheen of crude oil mix has spread across the Gulf of Mexico's surface around the area where an oil rig exploded and sank, a Coast Guard lieutenant said Thursday. "This is a rainbow sheen with a dark center," Coast Guard Rear Adm. Mary Landry told reporters Thursday afternoon. 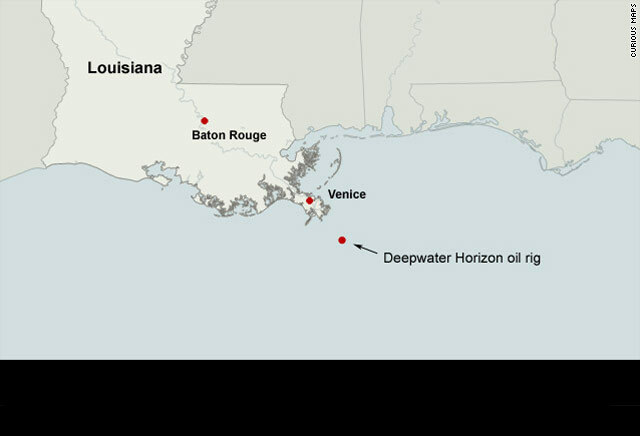 Officials do not know whether oil or fuel are leaking form the sunken Deepwater Horizon rig and the well below, but BP Vice President David Rainey said "it certainly has the potential to be a major spill." BP PLC operates the license on which the rig was drilling. A remotely-operated vehicle is surveying the area and cleanup efforts are already under way, Landry said. The sheen "probably is residual from the fire and the activity that was going on on this rig before it sank below the surface," she said. Meanwhile, the Coast Guard continued to search for 11 people missing after an explosion late Tuesday set the rig ablaze forcing workers to be evacuated from the vessel. Officials are still unsure what caused the blast. "We do continue with search and rescue," Landry said. "As time passes, however, the probability of success in locating the 11 missing persons decreases." Adrian Rose, a vice president for rig owner Transocean Ltd, told reporters that the missing workers may not have been able to get off the rig. "Based upon our reports from crew workers we met as they came in last night, they believe that they [the missing workers] may have been on board the rig and not able to evacuate. We have not confirmed that yet," he said. The company is still investigating the incident, but Rose said conversations with evacuated workers when they arrived onshore revealed "really quite heroic stories of how people looked after each other." The mobile rig was about 52 miles southeast of Venice, Louisiana, when the explosion occurred Tuesday night. There were no indications it was a terrorist incident, the Coast Guard said. Officials said 126 people were on board at the time of the explosion. Of the 115 accounted-for workers, 17 injured were evacuated by helicopter from the rig. Another 94 people were taken to shore with no major injuries, and four more were transferred to another vessel, according to the Coast Guard. It was not known whether the missing workers were able to make it to one of the rig's lifeboats -- fully enclosed, fire-resistant vessels designed to evacuate people quickly. The Coast Guardsaid calm weather conditions and warm Gulf waters increase the likelihood of survival for the missing workers. "We're still searching and there's still a probability that those crew members are alive," Senior Chief Petty Officer Michael O'Berry told CNN on Thursday afternoon. Carrol Moss told CNN-affiliate WWL that her husband had been rescued from the rig. But before she got the call, there were some anxious moments, she said. "The only thing I was thinking is how am I going to tell my kids that their dad is not coming home," Moss told the affiliate. "The worst goes through your mind. We were just blessed we got the call." As rescue crews continued searching for survivors, a federal lawsuit was filed Wednesday on behalf of one of the 11 missing workers. The lawsuit claims negligence by companies connected to the oil rigs that caused the explosion. Transocean and BP are named as defendants. BP spokesman Tom Mueller declined to comment on the suit, and a spokesman for Transocean did not immediately return a call requesting comment. The suit does not provide specific details about the blast, but says one man, Shane Roshto of Amite County, Mississippi, "was thrown overboard as a result of the drilling explosion, and his body has not yet been located." His wife, Natalie Roshto, is also named as a plaintiff. Rose, the Transocean vice president, said Thursday that the company was "deeply saddened" by the incident. "Our thoughts and prayers remain with the family members and our employees." Transocean's website describes the company as the "world's largest offshore drilling contractor and the leading provider of drilling management services worldwide," with 140 offshore drilling units. The rig involved in the explosion -- a mobile unit which moves to different locations in the Gulf of Mexico -- had been drilling for oil in its current location since January, said Eileen Angelico, a spokeswoman for Minerals Management Service, the agency that regulates the oil industry in federal waters. BP spokesman Mueller said dozens of vessels and aircraft were on the way to the scene Thursday afternoon, including equipment to minimize the environmental impact of any spilled oil. "This is the kind of thing we drill for every year and plan for it, but hope we never have to use it. Today is the day we are going to use it. We are prepared and are moving," he said. Up to 336,000 gallons could spill into the Gulf, based on the amount of oil the rig pulled out daily, O'Berry told CNN. And up to 700,000 gallons of diesel fuel could also leak, Coast Guard Petty Officer Ashley Butler said. As cleanup efforts ramped up, government and company officials said they planned to get to the bottom of what caused the explosion. "It's in our national interest, obviously, to know exactly what went wrong and to make sure something like this never happens again," Deputy Secretary of the Interior David J. Hayes told reporters Thursday afternoon.